Kick off your visit on the 10th (Sat): stop by Honeyville and then explore the wealth of natural beauty at San Juan National Forest. To find traveler tips, where to stay, maps, and more tourist information, read our Durango trip planner. The Route module can give you travel options from your home to Durango. November in Durango sees daily highs of 52°F and lows of 23°F at night. Wrap up your sightseeing on the 10th (Sat) to allow time to travel to Las Vegas. Start off your visit on the 11th (Sun): try your luck at Bellagio Hotel and Casino, take in nature's colorful creations at Bellagio Conservatory & Botanical Gardens, then get a taste of the local shopping with The Strip, and finally admire the local landmark of Bellagio Fountains. 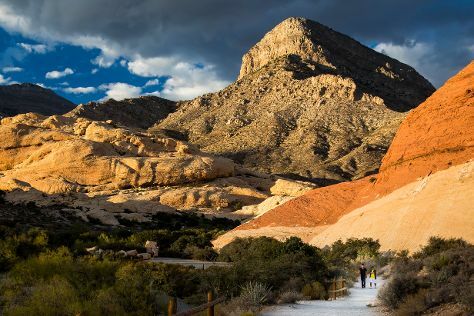 On the 12th (Mon), you'll have a packed day of sightseeing: take in breathtaking views at Red Rock Canyon National Conservation Area. To find photos, traveler tips, other places to visit, and more tourist information, use the Las Vegas day trip planning tool . You can fly from Durango to Las Vegas in 6.5 hours. Alternatively, you can do a combination of shuttle and flight; or drive. Traveling from Durango to Las Vegas, you'll gain 1 hour due to the time zone difference. When traveling from Durango in November, plan for a bit warmer days and warmer nights in Las Vegas: temperatures range from 68°F by day to 47°F at night. Finish up your sightseeing early on the 12th (Mon) so you can travel back home.